Having owned a few awd/4wd vehicles, I have learned that not all awd/4wd is created equal. Some gadgety kinds of awd are fine, while others...not as much. 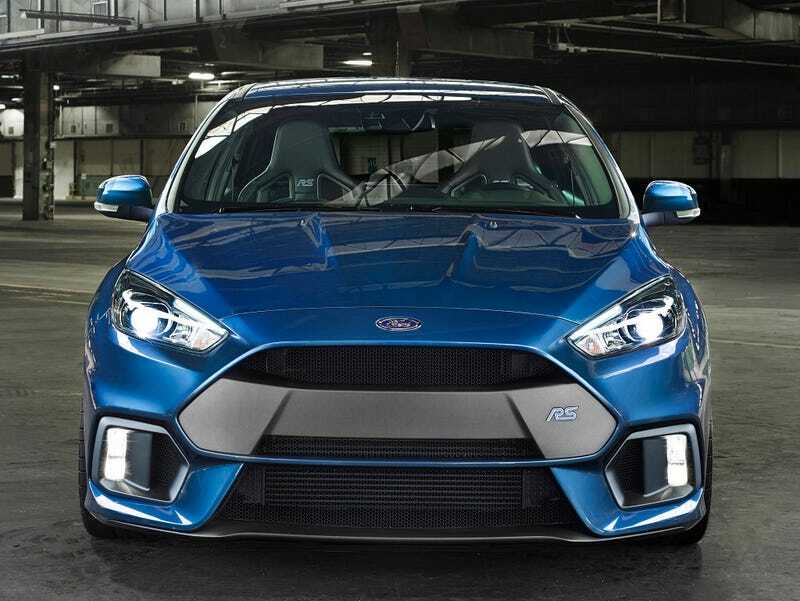 Most of the articles on the new Focus RS say it has some kind of torque-vectoring awd system but don’t go into details. Luckily, Ford has more information. Translation: There isn’t a center differential, but the rear diff has an electronically-controlled clutch pack that can send up to 70% of the power to the rear axle. It has another clutch pack that acts as an electronic LSD for the rear axle. The rear diff does active (i.e. not brake-based) torque vectoring. To deliver optimum driving dynamics, the Ford Performance All-Wheel-Drive system was calibrated alongside the car’s advanced Electronic Stability Control, in particular the brake-based Torque Vectoring Control system that works in parallel with the torque-vectoring AWD. Translation: The front differential is an open differential with brake-based torque vectoring. The hardware consists of a Power Take-off Unit (PTU) in the front final-drive that transmits engine torque through a prop-shaft to the Rear Drive Module (RDM). This incorporates a Torque Transfer Device (TTD) and an electronically-controlled Limited Slip Differential (eLSD). Both are wet, multi-plate clutch units from Haldex. Also, both the Ford press release and Haldex’s website talk about preemptively sending torque to the rear wheels, and Ford has used Haldex awd in other transverse-engined cars with similar platforms to the Focus. Haldex is sometimes a bit of a dirty word. Many people have the partly-mistaken impression that Haldex awd doesn’t send power to the rear wheels until the fronts slip. “Oh your car doesn’t have real awd, it’s just Haldex.” But remember, Haldex and Ford talk about preemptively sending torque to the rear wheels. Haldex can actually work pretty damn well for sporty handling, especially combined with a rear LSD of some sort. I used to have a Mazdaspeed 6, which had Haldex awd and a Torsen mechanical rear LSD. It was stupid easy to take turns way too fast, and rocket out of them. It was basically just an exercise in braking late, turning in, and then stomping on the gas. Based on the steering & throttle inputs, the Haldex awd would preemptively send power to the rear wheels before the fronts would spin, and that plus the Torsen rear diff gave plenty of rotation through the turn. Really, the only major downside of a properly-tuned Haldex awd + rear LSD system is deep snow. Because there’s no fixed resting torque split, Haldex tends not to keep all the wheels churning, and then you’re more like in a fwd car. My MS6 with Blizzaks on it was a very capable winter car, but I got stuck a couple times in the deep stuff precisely for this reason. Even with the traction & stability control fully disabled, I couldn’t get all 4 wheels to spin together. The computer couldn’t quite make up its mind. Luckily that car had a handy-dandy tow hook that screwed into a mount behind a plug in the rear bumper. So, for sporty driving and 90% of most winter driving situations, I’ll bet the Focus RS is great. But if you’re planning to drive through foot-deep snow drifts on a regular basis, well, can I perhaps interest you in something with a real center differential? UPDATE: There’s a slide from Ford that goes into more detail on the actual mechanical layout than the wording of their press release. Turns out the system is somewhat different mechanically than the Haldex/XWD although likely achieves a similar function.